Arabs in Jaffa conducted a relatively calm protest Monday, after a much wilder one in Nazareth, over the IDF's operation in Gaza. Hundreds of people protested in Jaffa Monday night against Operation Protective Edge, demanding that the IDF stop its campaign against Hamas terrorists. 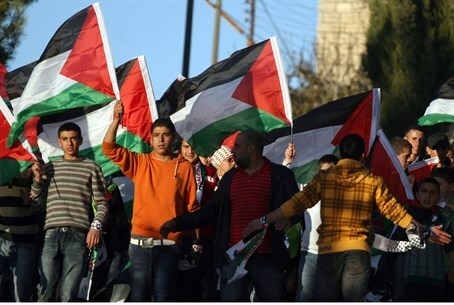 The protests were part of a national “Day of Rage” declared by Arab groups, consisting of protests and demonstrations in Arab cities and towns against the IDF operation. Right-wing activists attempted to conduct a counter-protest, but police prevented them from doing so. The activists, led by prominent nationalist Baruch Marzel and rights lawyer Itamar Ben-Gvir, sought to reach the Clock Square in the center of town. Several activists attempted to enter the area, and were physically prevented from doing so by police. “The police surrendered to threats by Arabs and is allowing them to incite against the state,” said the activists. Earlier, a chaotic demonstration was held in Nazareth, where over 3,000 people protested and threw stones and bottles at police. The protesters marched through the city and onto the main highway outside town, waving PLO flags and shouting anti-Israel epithets. Police tried to hold the crowd back, but were only partially successful. Protesters threw rocks and bottles at police as a full-fledged riot ensued, with police using anti-rioting defense measures to break up the crowd. Similar protests have been held in other Israeli Arab towns over the past several days; on Saturday, for example, Arabs in Kafr Kana rioted and faced off against police. Israeli drivers have been advised to avoid Kafr Kana, Nazareth, and other large Arab towns, as the atmosphere is very charged and a riot could ensue at any moment, security officials said. As part of the “Day of Rage,” the Arab High Monitoring Committee, a self-styled organization that claims to represent a large majority of Israeli Arabs, ordered Israeli Arabs to close their businesses in protest over the IDF's activities against Hamas. In response, Foreign Minister Avigdor Liberman (Yisrael Beytenu) called on Israelis to boycott Arab businesses that take part in a strike called by an Arab group over the situation in Gaza. Those who participated in the boycott, Liberman said, were acting against the interests of Israel, and Israelis should not support them, he added.